In a few words: Not as disturbing as Coraline (which is… a bit) and every ounce as entertaining as I hoped. Now, details: The Graveyard Book is Neil Gaiman’s latest YA novel. The story is about Nobody Owens, a young boy who starts the novel as a toddler that ends up in a graveyard late at night, all by himself. I’ll let Gaiman tell you how that happens, because the journey is all the fun here. Nobody Owens grows up, and Gaiman’s ghosts do all the parenting. There was a hand in the darkness, and it held a knife. The knife had a handle of polished black gold, and a blade finer and sharper than any razor. If it sliced you, you may not even know you had been cut. Not immediately. You’d think what follows would be a bit grisly, and I suppose it is, but it’s all so fantastic that I smiled through most of that chapter, with the sort of glow I get around Halloween. A pair of ghosts (the Owens’s) raising a live boy, that boy growing up and learning his letters off gravestones and his life’s philosophy from the perspective of dead but well-meaning people; well, it’s just a great idea, and it’s perfectly presented by Gaiman. My kids love it too. This is the kind of book that will be revisited in my house often. In addition, I’d say that if you have a Harry Potter fan on your Christmas list, this book might be just the right fit, and it has the added bonus of introducing him or her to the likes of Neil Gaiman, which in turn could open that fan up to the rest of the world of books as well. 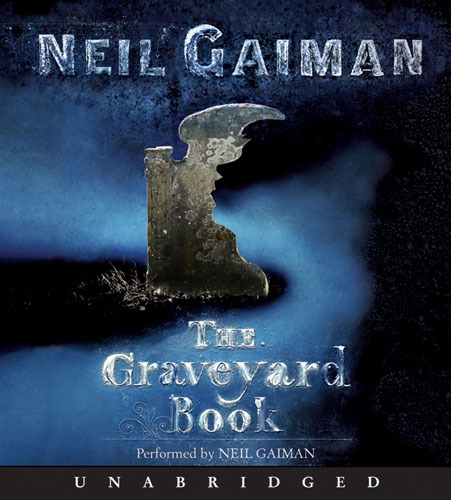 Gaiman also narrates, and like I’ve said elsewhere, he’s one of the few authors I’ve heard that could make a comfortable living as an audiobook narrator. I can’t imagine this audiobook being read by someone else, and I’m very happy that it isn’t. 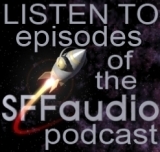 Edited to add the SFFaudio Essential, which was forgotten by the reviewer. He has been sacked. I agree that Gaiman is a fantastic narrator in his own right. Going back to the discussion of whether it’s a good idea for an author to narrate his own work, I think one of the advantages is that the author knows how he/she intended all the proper names and made-up words to be pronounced. Gaiman also does a great job of accents; I particularly liked his sultry performance of Liza Hempstock. Like you, when I heard those first lines I thought I might need to steel myself for some major unpleasantness. But Gaiman’s mix of humor with horror gives a wonderful balance to the work, making it fun instead of uncomfortable to experience. And you’re right – no one else but Gaiman should ever even think about narrating this book! I loved it … especially the way that every time a graveyard ghost was identified we would also hear what was on their gravestone. Those are the little touches that make a huge difference. Yes, for certain. Loved his Liza. My all-time favorite characters of his (and read by him) are Croup and Vandemar from Neverwhere. Just excellent, both the dialogue he wrote and his performance of that dialogue. Excellent point! It’s little details throughout that make it so enjoyable. Imagine Bod searching the graveyard for some of the rare letters, and his eyes lighting up when he finds them. You are so right – all the difference.